My lawn is showing signs of grub damage. What can Adios Pest Control do to control the grub population in my yard? Grubs are controlled most effectively when a lawn is treated from mid-summer to early fall. This is when they have recently hatched and are feeding closer to the surface. Your Adios Pest Control Specialist will determine the best time to treat your specific lawn. Adult beetles often return to the same area year after year to mate and lay eggs. For this reason, you will probably need an annual pre-emptive control program to help eliminate grubs and prevent further damage to your lawn. 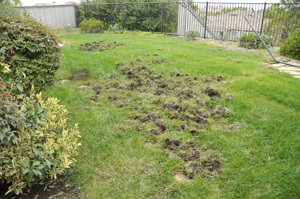 Not all lawns have grub infestations that warrant control. Our best estimate is that in our area only 10-20% of lawns have damaging populations – and these infestations are often limited to part of a lawn. Furthermore, lawns differ in susceptibility to white grubs because of differences in grass species, soil health, irrigation, amount of sun or shade, traffic, etc. A dense stand of grass with a healthy root system can generally tolerate up to 10 grubs per square foot, although skunks, raccoons, birds and moles sometimes damage turf, seeking grubs in lower densities. To determine how many grubs you have in your lawn you can use a flat spade to cut back a sample of turf. Count the grubs in the top 3 inches of soil and replace and water the turf. If you take a 6″ X 6″ sample (1/4 of a square foot), a grub density of more than 2-3 per sample probably warrants treatment. Take a dozen or so samples throughout the lawn area to determine which areas may need treatment. Adult beetles generally lay their eggs in July and most larvae should be present by early August, although in dry years development may be slowed. Depending on soil moisture, you may need to sample more than once to make sure you “capture” the grubs developing at your site. Since grubs are found in patches and do not generally infest the entire lawn, the more you sample, the more confidence you will have in treating only areas infested with grubs. There are several white grub species that cause similar damage to lawns in Southern California. Japanese beetles and Oriental beetles are the most common species, but we find quite a few Asiatic garden beetles and European chafers as well. It is best to get your grubs identified to the species level to optimize choice of insecticide against these pests. It is tempting to treat white grubs in the spring when damage is apparent, but spring treatments are generally ineffective. The large grubs present in the spring have already done most of their feeding and caused their damage and are now difficult to kill with insecticides. It is better to overseed damaged areas in the spring and wait until late summer to sample for a new generation. We recommend treatments between August 1 and September 15 only to those aesthetically important areas of your lawn that exceed 8-10 grubs per foot. Note that (as discussed below) two commonly used insecticides: Merit (imidacloprid) and Mach-2 (halofenozide) must be applied early in the season before eggs are laid in order to be effective against the fall larvae. With these products, treatment decisions should be based upon past history of grub infestation.